A lovely filigree fitting on top a topaz colored glass bead. Hangs from brass leverback earwires. 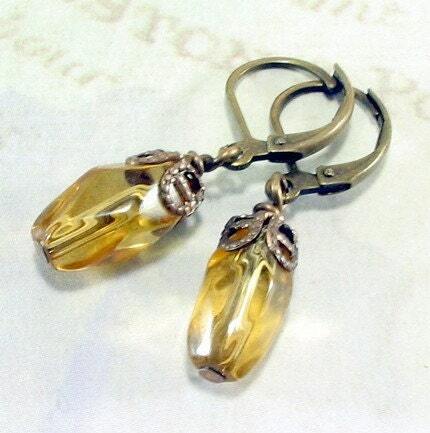 The earrings are a bit dainty and come in at just over 1 inch long. The brass is nickel free and not plated. The earrings come in a ribbon wrapped white gift box shipped inside a secure padded mailer. Your jewelry was made with quality materials and has a 90 day warranty during which free repairs will be made. Returns accepted for 7 days. Shipped on time. Love it! Looks like pictures shown.